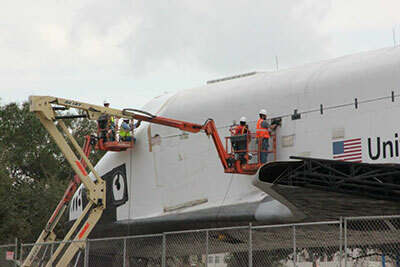 It was Explorer here at KSC, dunno why they feel they have to change the name (other than to erase where it came from). It is rather odd. I suspect poster JSC01 is onto the motivation for this...it's a publicity project. There's nothing intrinsically wrong with that, of course. It just seems so obviously contrived. I just watched the trailers for the new move Gravity that will be out this fall. 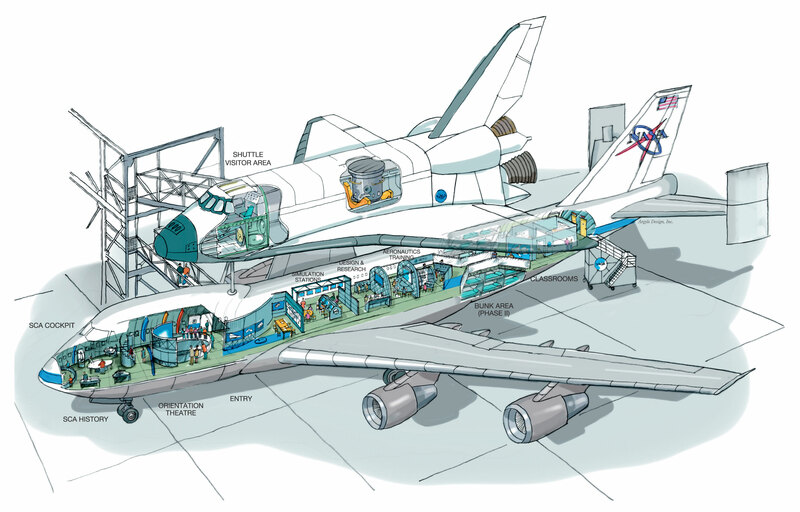 The shuttle is named Explorer. I'm assuming that came from the simulator. Google the movie and watch the trailers. There's 3 of them so far. Definitely worth seeing. We have a topic here: Alfonso Cuarón's "Gravity" (Warner Bros. Pictures). My understanding is the naming of the orbiter was coincidental and that the film production was unaware of the orbiter mockup by the same name. 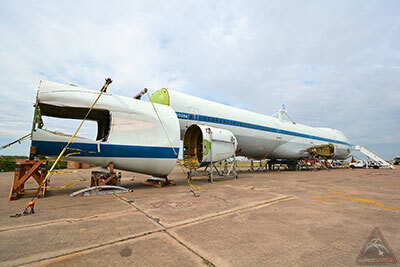 A NASA jumbo jet that for more than three decades ferried space shuttles across the country is now being readied for its own move, thanks to the support from the aerospace company that originally built the iconic Shuttle Carrier Aircraft (SCA). 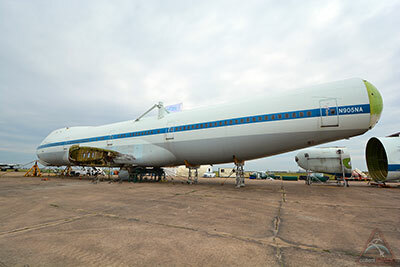 They are turning the inside of the 747 into a museum?! That is brilliant!! I must visit Houston. 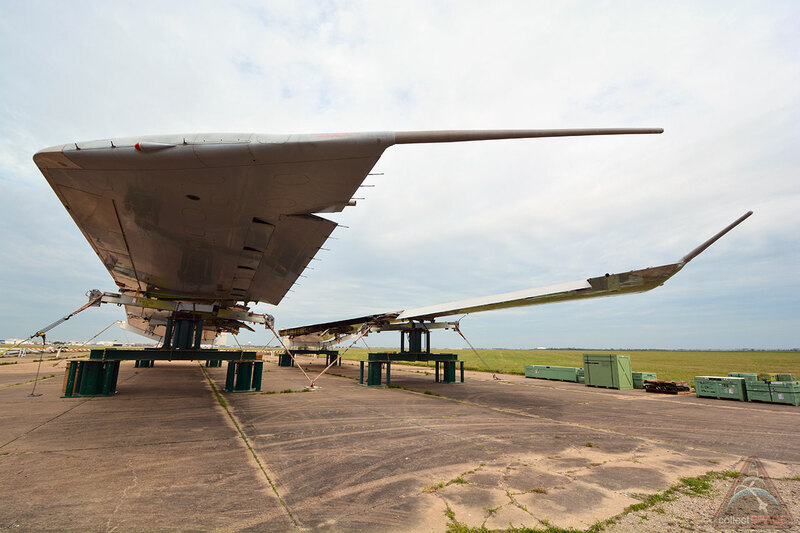 And, as it stands today, there will be no tail cone in the final display. 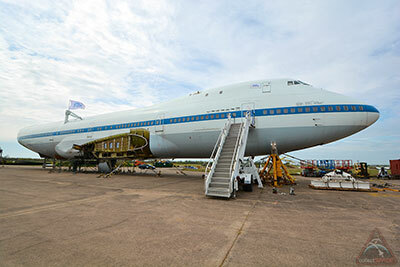 They are turning the inside of the 747 into a museum?! That is brilliant!! Agree... that is fantastic. 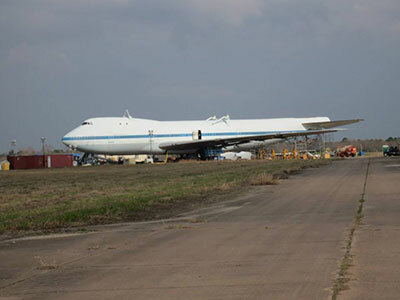 Why park a jumbo jet and just leave it empty? I cannot wait to see this display. 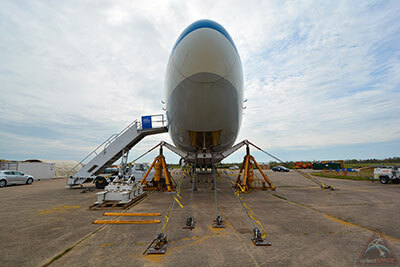 It will be neat to be able to go into the Shuttle Carrier Aircraft (SCA). Just another reason to go visit the Johnson Space Center. 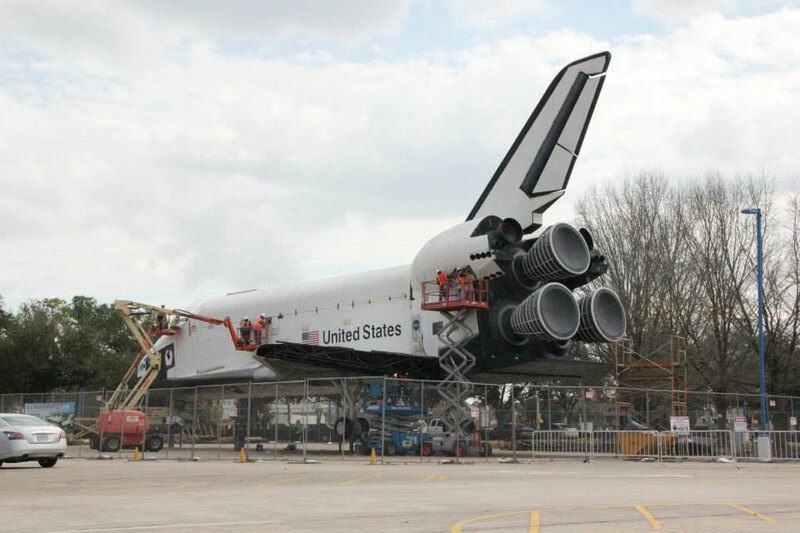 Houston's mock space shuttle has a new name — and a date for its reveal. 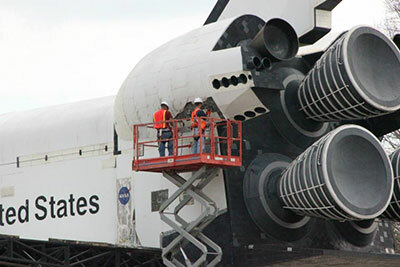 T minus 5 days to the shuttle name-reveal! Any last minute guesses? I think it will be interesting to see if they pick something more geared towards youth ('Adventure' or similar) towards history (some on this forum suggested Columbia, Challenger, or even both), or something along the sailing-ship tradition for orbiters (I favored 'Endurance'). 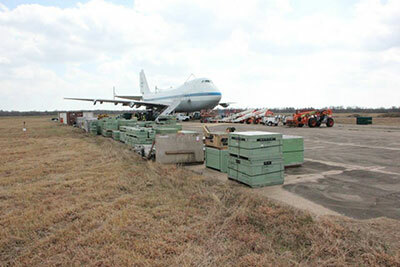 I was by EFD yesterday, I didn't see the 747. 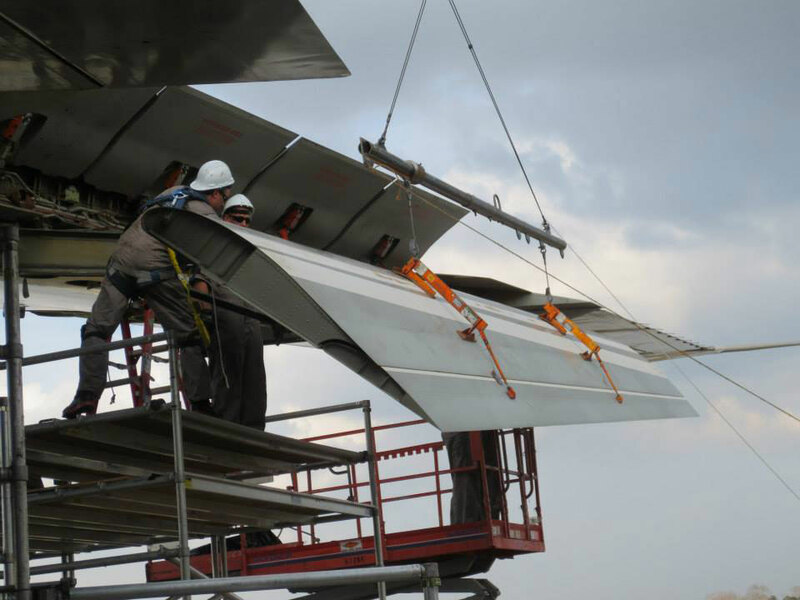 Perhaps work is beginning to dismantle? I think Eagle would be cool. Then it can be said "Houston, the Eagle has landed!" Will the Oct. 5 event happen if the government is still shutdown? 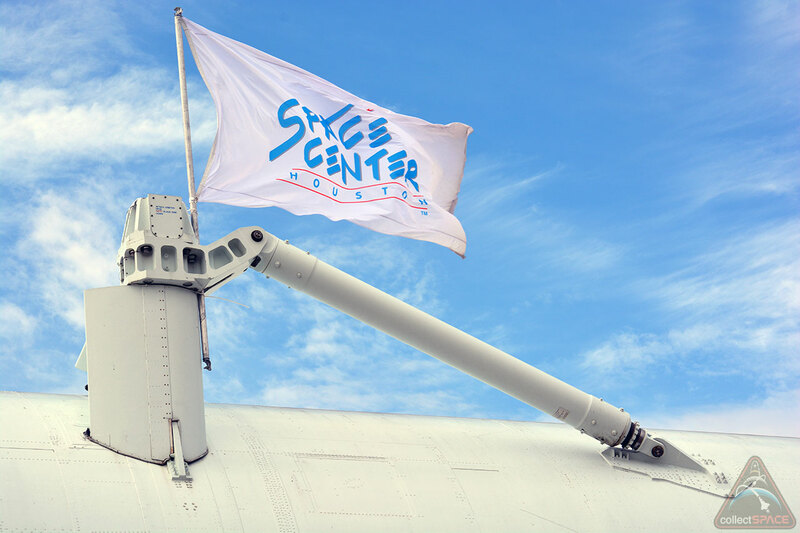 Despite the government shutdown, Space Center Houston is and will remain open for business, and this event will take place as planned. 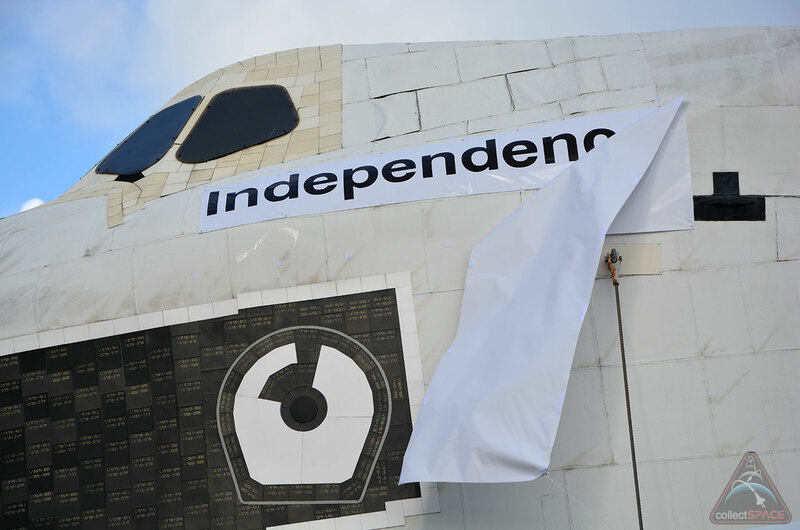 How ironic that they name the shuttle Independence, the same name that was used for the movie Armageddon. As noted in the article, Independence has a longer association with the real space shuttle than appearing as a fictional ship in "Armageddon." I think it is a great choice. I think it's a fantastic name. Interesting that it was #2 on Rob's list of original orbiter names on the previous page... With the contest happening, I really thought they would go for something a bit more novel. 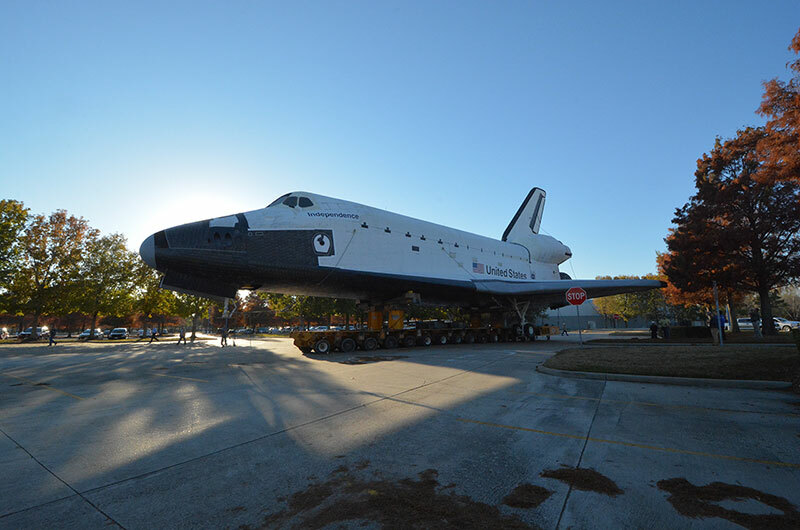 But I do love the quasi-link to the heritage of the original shuttle program. And the patriotism. Kudos SCH. 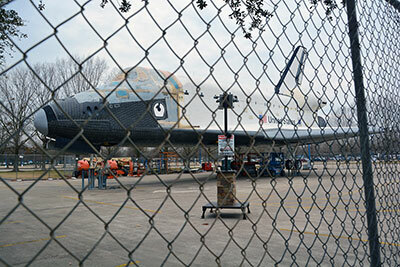 Space Center Houston is in the process of placing the massive 747 Space Shuttle Carrier at our front entrance. 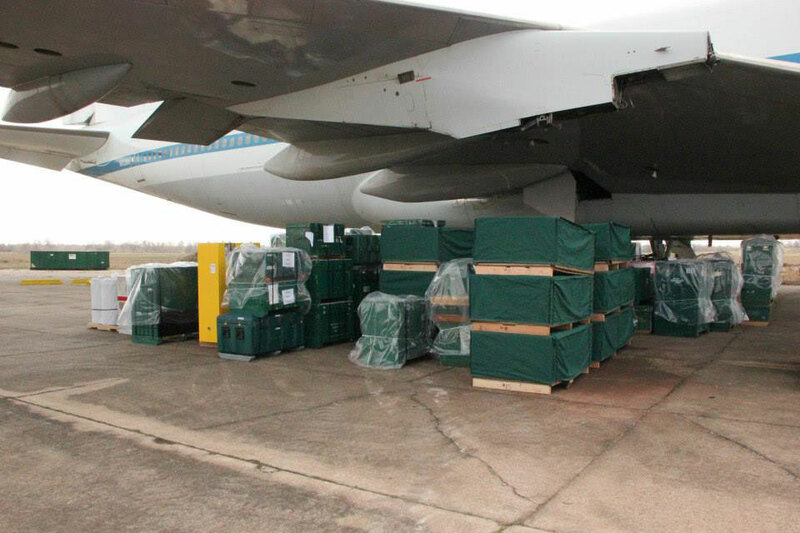 This video documents every move made since it was officially handed over. 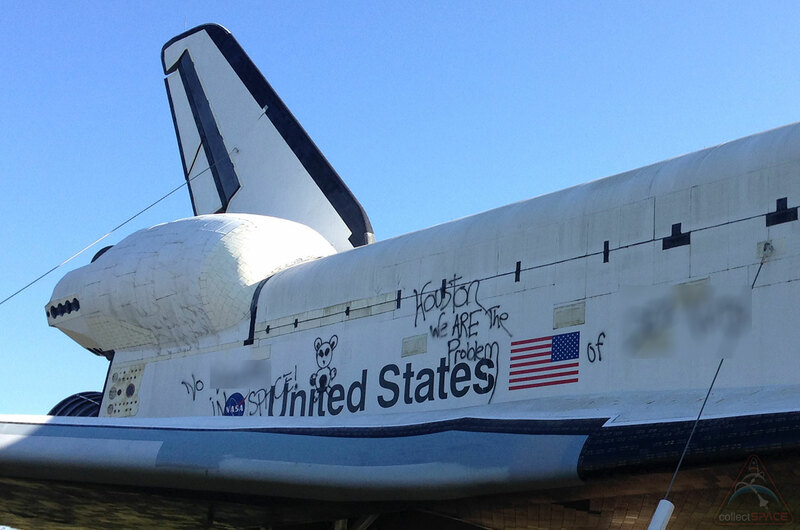 The graffiti, which included the phrase, "Houston, we are the problem," was limited to the side of the space shuttle that faced away from the center's parking lot. ABC-TV local news is reporting that written on the starboard wing was the phrase "Sorry, drugs made me do it." Still no clue as to the socio-political agenda, if any, of the stupid tagger/vandal. 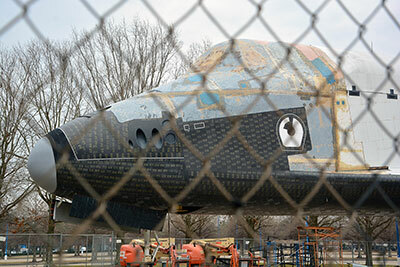 Space shuttle Independence has a new parking spot. 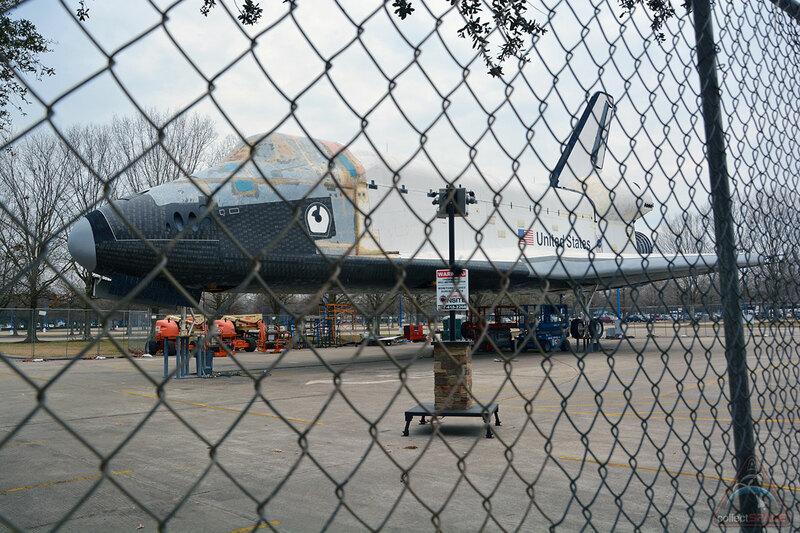 Space Center Houston's full-size shuttle replica embarked on a short trip on Tuesday (Dec. 17) as it was moved from its outdoor display location of more than a year to a spot in the adjacent parking lot. 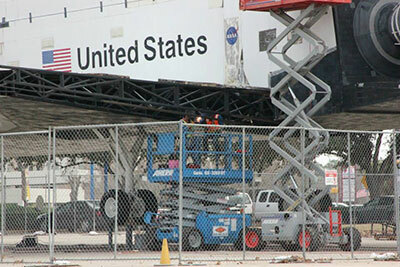 Riding on top of a motorized transporter similar to the 144-wheel vehicle that in June 2012 brought it to Space Center Houston, the visitor center for the NASA Johnson Space Center, the 123-foot-long (37 meters) shuttle mockup was moved from its place alongside the center's main building into the lot, where it will stay for the next several months. 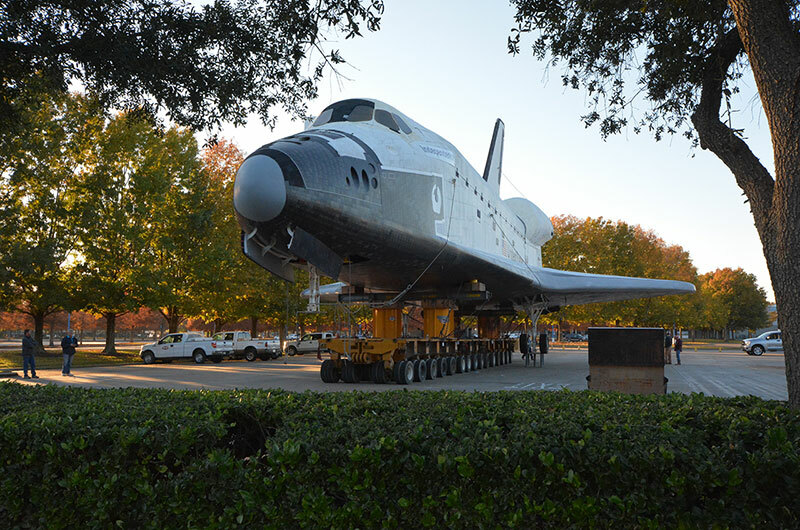 See here for more photos from Tuesday's (Dec. 17) short move of space shuttle Independence. Great to hear the project is moving along, and we're only a few short months away from seeing the 747 spread it's wings over the space center. 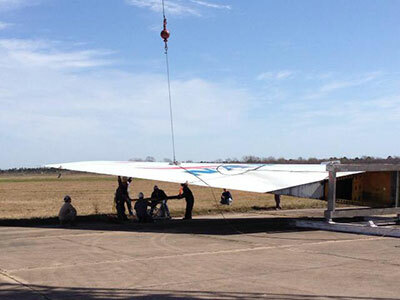 For Independence, looks the rear portions of the wings were taken off... any reason for that? Perhaps some repairs are underway? 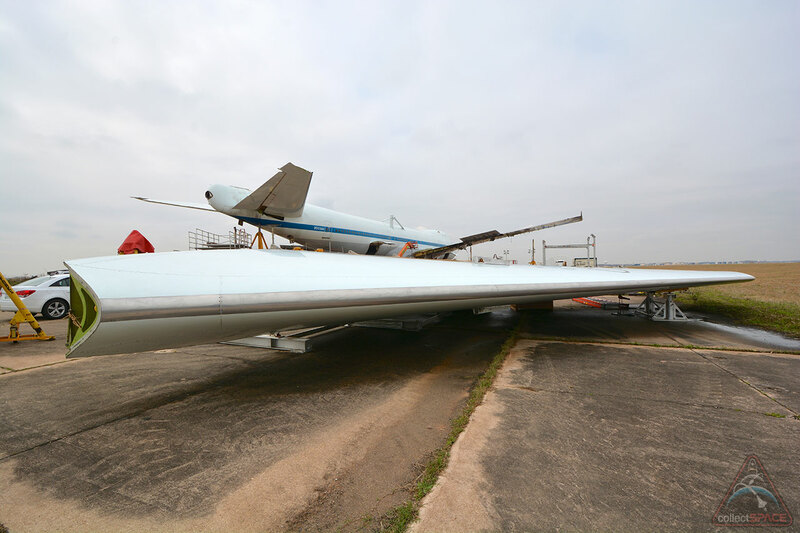 The elevons were removed for refurbishment and the entire orbiter mockup will be going through an overhaul inside and out before (and, as needed after) its mounted atop the Shuttle Carrier Aircraft. collectSPACE will be providing coverage of each step of the way, both behind the scenes and at each milestone event leading up to the opening in 2015. Does anyone else HATE that OV-100 just has a cloth over the old name? Shouldn't they make new tiles to make it look at least slightly nicer? The cloth name banner is temporary. 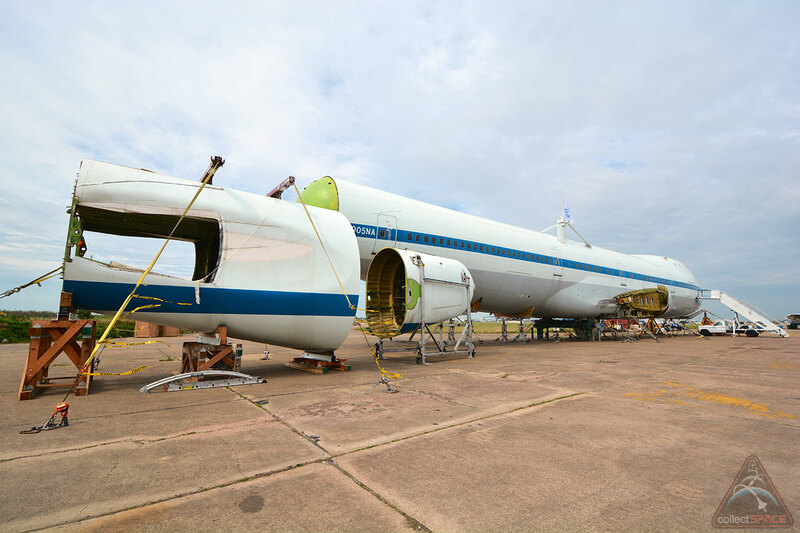 The mockup will be completely repainted, including having its name properly added, before being mounted on the Shuttle Carrier Aircraft. The vehicle number is sequentially assigned within the series, beginning with 1. Therefore, there can never be an OV-100 as it would read "Orbiter Vehicle Series 1 Vehicle 0". 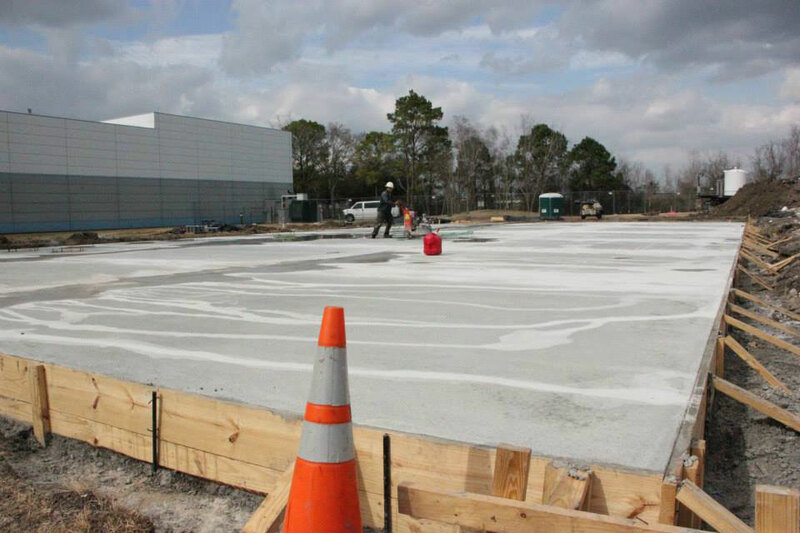 Work is now underway to lay the foundation for the Shuttle 747 Carrier plaza and to restore the space shuttle Independence mockup. 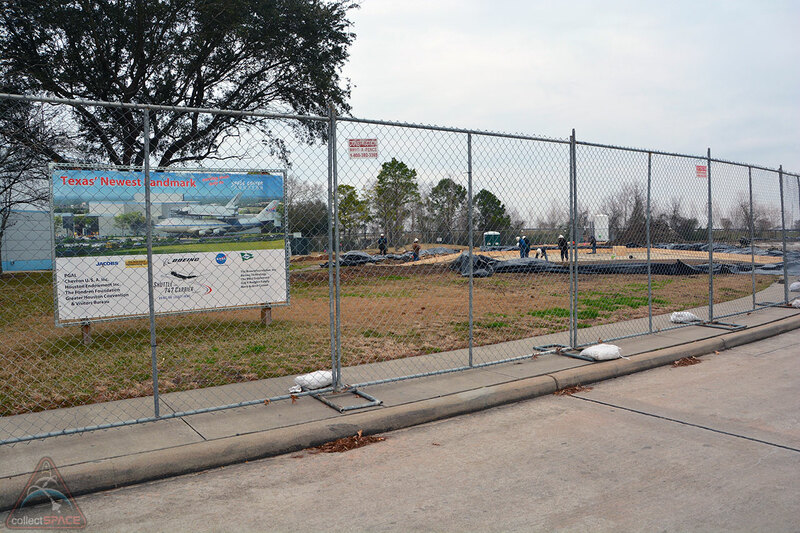 Photographs taken Feb. 6, 2014. 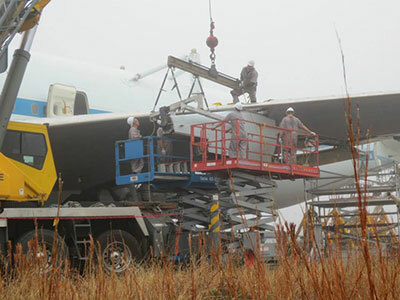 The space shuttle replica "Independence" undergoes cosmetic and structural alterations in preparation for installation on top of the shuttle carrier aircraft. 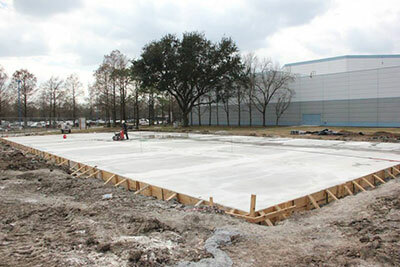 The foundation for the Shuttle & 747 complex undergoes final preparations before the big move. 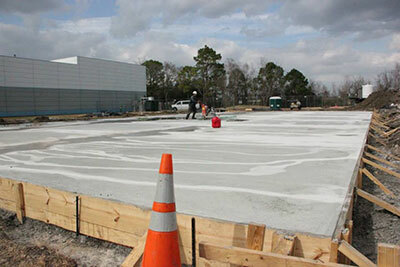 On February 15, contractors poured 340 yards of concrete. This morning (Feb. 17) an elite group of Boeing engineers, simply known as the "Aircraft-on-Ground (AOG) Team," arrived at Ellington field to deliver 14 tractor trailers of equipment for the disassembly of the 747 Shuttle Carrier Aircraft. The Boeing AOG (aircraft on ground) team is working through the weekend to get ready for the BIG move at the end of April. Here, the Shuttle Carrier Aircraft's vertical stabilizer being lowered. 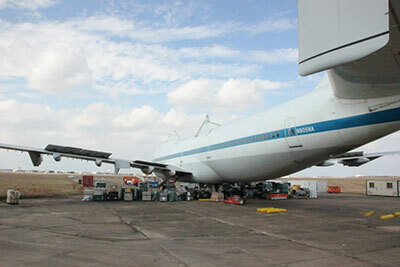 Work continues to progress on the 747 Shuttle Carrier Aircraft disassembly. The historic NASA jumbo jet that ferried retired space shuttles piggyback to their museum homes is now being prepared for its own lift to where it will be put on public display. Parked on a remote tarmac at Ellington Field in Houston, NASA's original Shuttle Carrier Aircraft (SCA) can still be recognized as the specially-modified Boeing 747 it is, but seen from a distance its silhouette looks wrong. 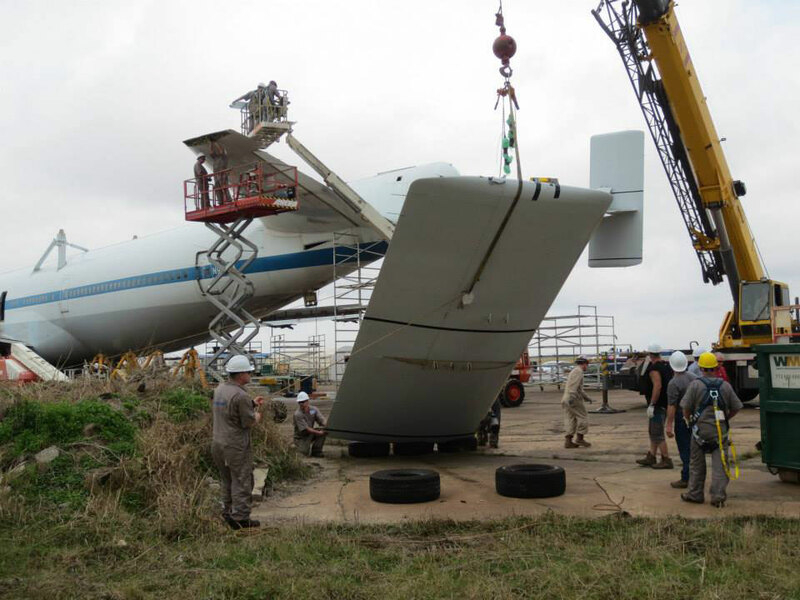 A closer inspection reveals why; the plane's tail (vertical stabilizer), ailerons, engine nacelles and landing gear have now been removed. If the SOFIA program gets stopped, will 905's engines wind up back on the SCA or get stored for a time when SOFIA gets reactivated? I inquired about this, and almost included mention of it in today's article. 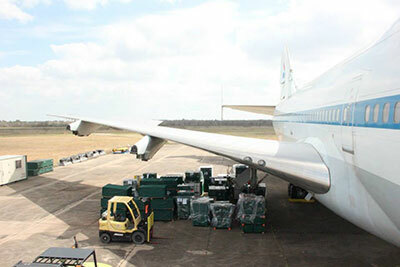 The engines are not likely to return (whether they are retained by SOFIA or used elsewhere wasn't known). 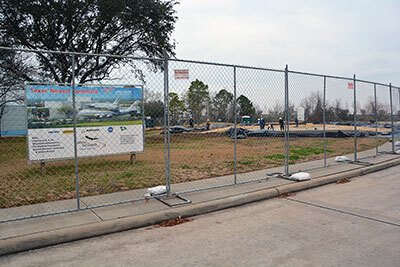 Space Center Houston is still working with Boeing and the exhibit designers on whether replica engines will be used or if other real but retired engines will be sourced. The disassembly of NASA 905 was completed on Wednesday, March 26, 2014 by Boeing's Aircraft on Ground team at Ellington Field. The Shuttle Carrier Aircraft (SCA) will embark for Space Center Houston in late April (specific dates to be announced soon). It's simply amazing to watch this unfold. 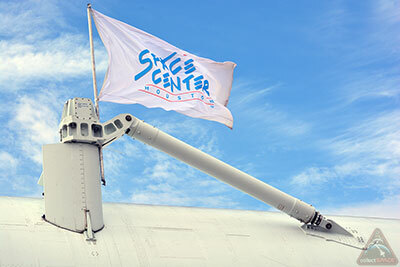 Extremely impressed with the Space Center Houston folks for pulling this off... Also with the ongoing renovations to Independence. She's almost glowing now, with her new exterior renovations and tile work. Kudos!